This 148-page journal includes 68 prompt pages and 76 matching blank lined pages to expand your thoughts on the prompts or write about your own topics. Pages print 2 to a sheet, so it only takes 74 printed sheets of paper and will paste into a 5″x8″ journal, if you want a more permanent binding. These cute printable pages are awesome for tween and teen girls as well as women of all ages. 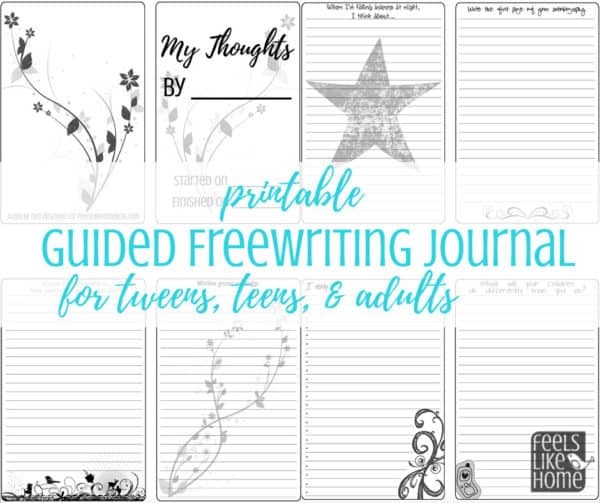 It can be used for guided freewriting in a homeschool or formal school setting as well as a traditional journal in a less structured setting. The prompts will make you think about your life and choices, as well as your past and future. I personally love journaling as a means of self-care. Journaling allows me to tap into a normally unexplored area of my brain, a place where I don't have to censor my thoughts and can just freely write about whatever pops up. It leaves me feeling free and light and unburdened. I wish the same for you. You can read more about this printable journal in this blog post.